I know this sounds weird but not to a science geek. I would like to make sure my REST calls propagate around the globe - not just to a server on the other side of the earth like from us-east-1 to the Singapore region but through us-west-2 through singapore - to europe and back to us-east-1. Sort of when I fly - in order to maximize the number of takeoffs and landings - I try to get the most number of stops - a direct flight is not the best way to get somewhere when testing latency - as in packets on the cable from Oregon to China are better routed through Hawaii. 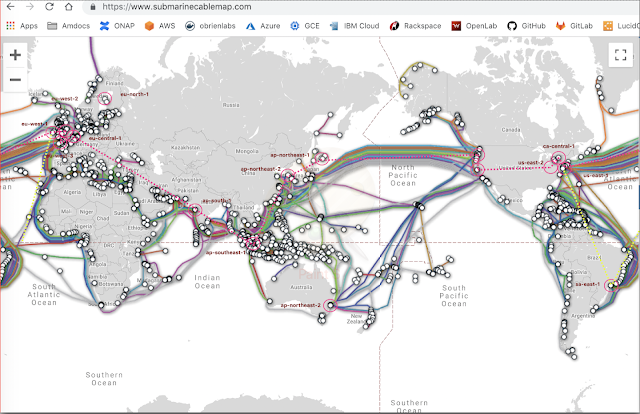 I liked Andrew Blum's "Tubes" book - which include details on the endpoints for sub-marine cables - https://www.amazon.com/Tubes-Journey-Internet-Andrew-Blum/dp/0061994952 - I also ran into a bit of this propagation delay working at Nokia. This is the path we will take - hopefully no backtracking and ideally it is roughly valid - as we do not actually cross the equator - I will also try through Sau Paulo.